Have you ever felt the small extension located at the end of your sternum? It is the Xiphoid Process. Read this article to know about the development, functions and certain disorders of this extension. It is a pointed cartilaginous extension attached to the breastbone or sternum. It is the lowest and smallest part of the sternum. The Xiphoid Process, also known as the xiphisternum or metasternum, is initially a cartilage which becomes ossified (hard and bony) in adults. The name “Xiphoid” is derived from the Greek words “xiphos” meaning “straight sword” and “eidos” meaning “like”. The sword-like appearance of the extension earned it the name. The small Xiphoid extends from the place where the lowest ribs are attached to the breastbone or sternum. The extension is marked by a small hole. It also has a sharp tip resembling that of a sword. 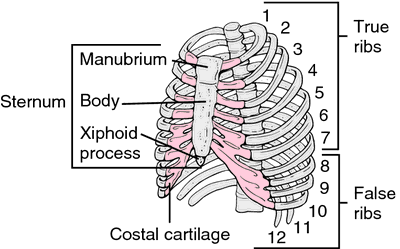 The part of the sternum located just above the Xiphoid Process is known as the manubrium. The Xiphisternal joint is the immobile point between the two sternum portions. This process is sometimes naturally bifurcated and can also be perforated sometimes. These morphological variations are not harmful for the health. They only make the Xiphoid Process look different. This cartilaginous extension can be seen and felt in infants. At this stage, the Xiphoid Process is a lump located below the sternal notch. It becomes ossified and gets fused to the sternum as the individual grows up. 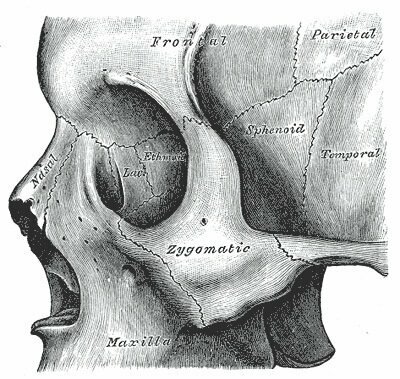 The cartilage becomes hard and bony anytime between an individual’s 15 and 29 years of age. This pattern of a cartilage becoming ossified with age is quite common in human body. Many other human bones such as the growth plates of the limb bones are also initially cartilages that are later replaced by bones. It works as the attachment for many important muscles like the abdominal diaphragm, which is a sheet-like muscle necessary for breathing. The rectus abdominus and the transversus thoracis muscles are also attached to the Xiphoid. Care should be taken not to put any pressure on the Xiphoid Process during cardiopulmonary resuscitation (CPR). It is an unsupported structure and can break off under pressure. A broken Xiphoid can damage various internal organs and cause serious pain and inflammation in the chest. There are many CPR hand positions that are unsafe for women as the hand extends past the sternum base in these positions. These hand positions increase the risk of breaking the Xiphoid Process. The structure is often used as a landmark in CPR because it is easy to locate this extension and it can help to remember the location of the heart-apex. Sometimes, this structure can also bend to form a lump that sticks out from an area around the chest. This lump generally does not cause any problem for the individual in the initial stage. However, it can be very uncomfortable when the individual tries to lift weight or eats a heavy meal. This condition should be treated at the early stage otherwise it can cause serious problems. One can experience severe pain and inflammation in the swollen Xiphoid Process. Sometimes, this extension may break off completely due to some accident or trauma. It can cause various health problems such as chest pain, breathing difficulties and nausea. However, a protruding or broken Xiphoid Process does not generally cause death of the victim. 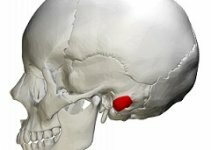 There are numerous reasons that can make the Xiphoid Process protrude outwards. People who lose weight can feel the extension sticking outwards. The excess weight might put enough pressure on the Xiphoid Process to bend it. Sometimes it may feel like the extension has enlarged but generally, it causes pain just by protruding outwards. A serious chest trauma or an accident can also damage this small bone. A protruding Xiphoid Process is often mistaken for a tumor, hernia or even cancer. However, the lump near the end of the sternum is generally harmless although care should be taken so that the extension does not break off completely. One should immediately consult a doctor if experiencing pain in the lower parts of the sternum. Usually, various tests and examinations like the x ray are done on the patient to understand the situation properly. The treatment is done based on the x ray report. Doctors generally recommend hot or cold treatment for this condition. There are also various medicines that help to lessen the pain. Patients are also advised to use elastic rib belts to avoid further dislocation of the Process. This medical condition is generally treated by using anesthetics and steroid injections. According to some people, the Xiphoid Process does not have any serious functions. However, it works as an anchor for several important muscles. It can cause serious pain and health problems in case it breaks off the sternum. It is possible to remove the Xiphoid Process by surgery. The removal process is known as Xiphoidectomy. This surgical procedure is really complex and should be performed only by experts. There are also other simpler surgeries for removing the extension. One should consult a Cardio-thoracic surgeon to decide upon the most suitable surgery for an individual. Xiphoidectomy should only be considered after all other treatments for relieving the Xiphoid pain have failed. 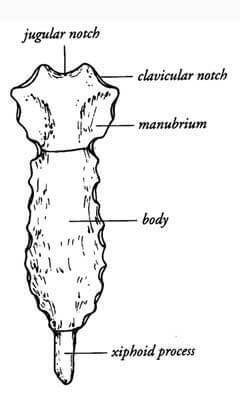 Here are some images of this cartilaginous extension of the sternum. Note the sword-tip like appearance of the process. I had bypass surgery. When the Doctor cut my ribs open, he damaged my xiphoid. I suffered for one year. then I found a Thoracic surgeon who removed the xiphoid. Appears to be healing well. Been a real life nightmare! Can you live without your xiphoid process, if it is broken off? I have been having issues with my X process since an old football injury in high school. It is now very large and has not given me any problems or pain after it healed from the first incident 40 years ago even though it is the size of a small walnut, it has simply been uncomfortable. Last week I hurt it doing an exercise Webmd recommended we do to strengthen back muscles, you lie on your stomach and lift your arms up, the first time I tried it snap, crackle and holy S word batman, the pain was horrific as I think I snapped it. This injury is terrible, it is extremely slow to heal and I will probably have to stop working out for months, even walking briskly hurts it and the slightest touch hurts a lot. I want to get it removed but I read it attaches to a sheet of muscles covering the stomach area and is extremely complicated to remove, I thought it could simply be snipped off with a pair of garden sheers, but oh no, it has to be complicated. It sure has a lot of nerves in it. When I told my PC doctor and Cardiologist they both ignored me, now it is to the point to where I have to have something done, they can no longer ignore me, the jerks. I suppose they ignored me due to not knowing anything about it or due to the difficulty in removing it as it takes a cardiologist to do so. Protect your X process but normally an injury is something unavoidable. I’ve been experiencing a dull pain in my chest below the sternum and have a tight feeling around the chest like a band putting pressure on me, so much so that I take off my bra after work. I also feel full and bloated, and look swollen in that area. This is also causing backache. I don’t have any pain in my chest, no nausea or vomiting, just had occasional diarrhea the last week. Can this be the xiphoid that is inflamed? I don’t think it is a hernia as I don’t have stomach problems. my cardiologist said that my protruding ziphoid process was related to the heart condition i have ie bispudic valve (left ventricle ) i was born with & which is clogging, calcification .? My muscle enzymes have been up in the 500-600 range for awhile now and I am being referred to a Neurospecialist. I went to the hospital today to have a gastric emptying test and as I discovered a lump below my sternum. It only hurts when I touch it. I know major muscles are attached there. I have been having great difficulty breathing. Do you think all of these are connected and should I be worried? I have had trouble with my xiphoid for some years now. Lately the pain has been so bad. I have problems with vomiting and direaha. The pain is rough. it has grown it is the size of a small egg. My Xiphoid grew inwards in the shape of a “C”. I also experienced severe chest pains and most of the symptoms mentioned above. Four days ago I had my Xiphoid removed by an Orthopedic surgeon and all those symptoms disappeared. It is still a bit sensitive, but feeling much better. My Xiphoid also felt like a small egg like in Julie Hill’s case. To my experience, I would say one needs about 1 to 2 weeks recovery after the operation. This “C” shape Xiphoid was also mistaken as a lump, but it was the roundness of the “C” that felt like a lump. I have been suffering for years about xiphoid syndrome. It pains me a lot with side headeache and nausea. Before I can touch it but now I can’t even feel it with my fingers. It gives difficult breathing sometimes. I had a small outpatient surgery in 2013 that left me with terrible pain in my chest for two years. After surviving on Oxy for those two miserable years, I found a Thoracic surgeon who performed a Xiphoidectomy in 2016. 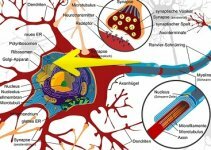 It has been 1 1/2 yrs and I am still having a terrible problem with nerve pain. Has anyone else had a similar problem? I had xiphoidprocess(extend sternal bone) for nearly 2years..but there is no pain..anyproblems…but I feel fear…wat to do?is it dangerous? I had a gallbladder ultrasound and the technition started under my xiphida process pressing very hard under it moving the probe hard upward that made me chreng, gasp and moan in excruciating pain exceeding the standard 1 to 10 scale being at a level 12 and finally moving his probe away from it over to the gallbladder and completing his gallbladder ultrasound. I am left with immediate pain surrounding my xiphida process that became so unbearable that after four days later growing worse sent me to the emergency room to a doctor who knew little about how to image or treat it, ” this seldom happens and it’s hard to get a good image of it”. He gave me two pills, one morphine and something else that helped the pain and inflamation, but it returned the next day came back at a 5-7 level of pressure and burning. I tried 15 minutes of ice on and 30 minutes ice off the morning before going to the emergency room at 3 pm the same afternoon as the ice on off made it hurt worse in my case. Sleeping is difficult now trying to escape the pressure and burning of my xiphida process. Based on this article the ultra sound that damaged it, is the best way to image the damage the technition did to it. Need best sleep position and meds to get an uninterrupted good night’s rest. Sleepless in ElDorado Kansas!